While giant ore boats and graceful steamships have drawn tourists to the Duluth Ship Canal for over a century, the harbor they call on couldn’t function without the work of the small, ungraceful tugboats that handle the bulk of the waterfront’s dirty work. Countless tugs have served the Duluth-Superior Harbor over the years, guiding much larger vessels to dock and pulling them free when they beached. A severely cold winter can easily freeze over the bay, sometimes even the lake. Before the Coast Guard began supplying the harbor with ice-breaking vessels, it was up to privately-owned tugs such as the Record and James R. Sinclair to keep shipping lanes open. 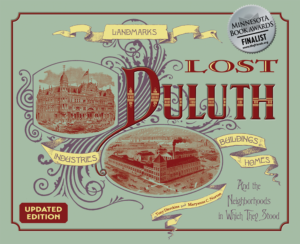 The Record came to Duluth in 1887 as part of the Inman Tug Line, later Union Towing & Wrecking Company. The Record had a record of sinking. She first sank after colliding with tug Joe D. Dudley in 1895, and she crossed the Robert Fulton’s bow during a heavy storm and went down in 1898, taking three lives with her. She was raised only to be rolled and sunk again in 1899 after the whaleback James B. Nielson increased speed while the Record was towing her; another life was lost. Even at rest she was at risk: in 1902 while docked in Superior, she was struck by the Bradford and sank, costing another life. She was moved to Michigan in 1927 and scrapped in 1975. Duluth’s Union Towing & Wrecking Company acquired the James R. Sinclair in 1907. She served the Twin Ports until 1938. Since the steam dipper dredging tug Ishpeming first dug the Duluth Ship Canal in 1871, dredging tugs have served to keep the St. Louis Bay and canal navigable by removing silt deposited by the St. Louis River. They also played instrumental roles helping free grounded ships. In 1985, when the Socrates ran aground off Minnesota Point during a November storm, the work of dredgers and seven tugboats directed by Dorocher Dock and Dredge company refloated the vessel. The William Saphanco performed dredging duties in the 1880s. The most famous of the dredgers was the 116-foot long Col. D. D. Gaillard, built in 1916 by the U.S. Army Corps of Engineers and responsible for most of the work widening the St. Lawrence Seaway. The Gaillard was named for Lieutenant Colonel D. D. Gaillard, who oversaw the Duluth Ship Canal Pier reconstruction of 1896–1902 and helped build the Panama Canal. Two years after he died in 1913, President Woodrow Wilson ordered the Panama Canal’s Culebra Cut renamed Gaillard Cut in the Lieutenant Colonel’s honor. 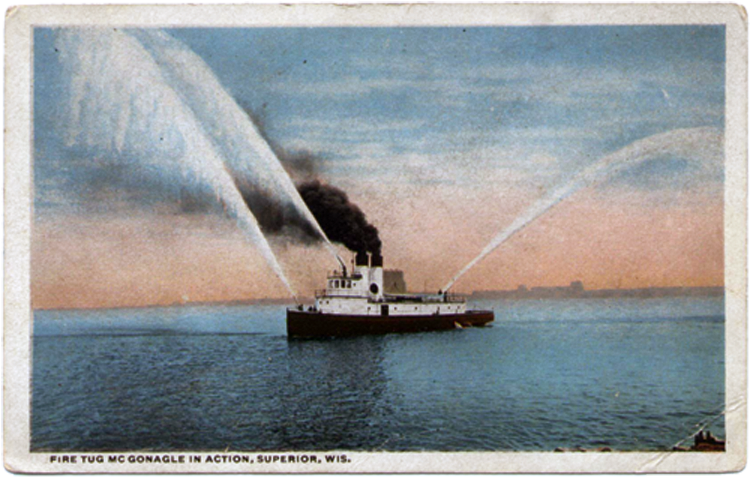 Built in 1908 for the Duluth, Missabe & Iron Range Railroad Company, the McGonagle (named for DM&IR president William McGonagle) was a 110-foot fire tug. She served the Twin Ports until 1935, not only putting out fires but helping in celebrations, such as the arrival of the Leif Erikson replica.